The Apache trout (Oncorhynchus apache) is one of only two trout native to Arizona, the other being the Gila trout (Oncorhynchus gilae) Gila trout recovery. It is officially designated as Arizona's state fish, and was historically found only in the headwaters of the White, Black and Little Colorado Rivers above 5,900-feet elevation in east-central Arizona. Apache trout have an olive-yellow body, with a yellow or golden belly. Moderate-sized black spots are spaced evenly across the body, head and fins. Fins are tipped with a white or orange color. Two black spots are located horizontally on the eye fore and aft of the pupil, creating a black band through the eye. They can grow to over 20 inches in length and weight up to 5 pounds in hatcheries and lakes; however, most wild Apache trout are less than 9 inches in length, a reflection of the small stream habitats where they live. Once nearing extinction, the Apache trout is now returning to its place in the legacy of Arizona’s unique, native fish resources. Apache trout have been restored to much of their historic range in the White Mountains after decades of cooperative protection and recovery efforts. Because the species has recovered sufficiently, anglers can now fish for them in designated state waters or on the Fort Apache Indian Reservation. This native trout is an important part of Arizona’s natural heritage, and is a recreational and economic asset to the state. The Apache trout is found nowhere else in the world. Photograph entitled “A Days Catch, White Mountains near Springerville, Arizona”. Date was thought to be pre 1900s, and the location was thought to be Becker Creek, Fort Apache Indian Reservation. Apache trout were once abundant in White Mountains in the late 1800s. Historic photos and accounts show early settlers harvesting hundreds of Apache trout in a single trip. In the early 1900s, state and federal wildlife agencies began stocking non-native trout species into the streams and lakes of the White Mountains to increase fishing opportunities for Arizona’s fast-growing population. Officials believed they were addressing the problem of over-fishing in Apache trout streams and did not realize these supplemental stockings would become one of the greatest threats to Apache trout, nearly wiping them out. Nonnative trout – rainbow, brook, cutthroat, and brown – out-compete Apache trout for limited food and cover, and prey upon young native trout. Rainbow and cutthroat trout are also genetically similar and cross-breed with Apache trout, compromising the genetic purity of each species. Early methods of livestock grazing, timber harvest and other land uses also impacted the habitat of these once pristine coldwater streams. Land use practices removed the stabilizing, shading effects of sedges, grasses and willows along stream banks, ultimately causing erosion and general habitat degradation. These impacts led to widened streambeds, increased stream temperatures, clogged gravel spawning areas, and reduced mayfly and caddis fly populations, the preferred trout food. Reservoir construction for irrigation and recreation and flood control altered stream flow patterns, creating artificial barriers to natural fish migrations. Apache trout require clear, cold, gravel-bottomed streams and could not withstand these changes. Once plentiful throughout the estimated 820 stream miles in the White Mountains, pure Apache trout declined in numbers and distribution, and were reduced to only 30 miles of stream habitat by the mid-1950s. The White Mountain Apache Tribe took the first critical steps to conserve the species in 1955 by closing fishing on reservation waters that contained any remaining pure trout populations. Apache trout became one of the first species to be federally listed as endangered in 1969. In 1975, representatives from the Arizona Game and Fish Department, White Mountain Apache Tribe, US Fish and Wildlife Service and USDA Forest Service formed the Apache Trout Recovery Team. Its goal was to develop a plan that would recover the species and ensure the long-term survival of Apache trout in its historical range. Early conservation work and the successful efforts of the recovery team led to the downlisting of Apache trout in 1975 from endangered to threatened. Simultaneously, a special rule under the Endangered Species Act was adopted, allowing limited fishing of pure Apache trout in specific areas, which led to valuable angler support for the conservation of this species. Under the team’s recovery plan, the species may be considered recovered and potentially removed from endangered species list when 30 self-sustaining populations have been established within historic range. Recovery will be especially significant because at present, no fish species has ever been removed from the endangered species list, except those that have gone extinct. Most of the threats have been addressed and we are close to reaching the recovery criteria of 30 populations. Stream restoration is also done to improve degraded habitat conditions in recovery streams. Restoration efforts can include fencing along stream banks, modifying livestock grazing practices, managing local elk herds, stabilizing stream banks with new vegetation, and closing unnecessary roads and stream crossings to reduce erosion. The success and progress of Apache trout recovery is the result of decades of cooperative protection and recovery efforts by the recovery team and a number of partners, including the US Fish and Wildlife Service, USDA Forest Service and White Mountain Apache Tribe, plus private partners such as Arizona Flycasters, Anglers United, Arizona Wildlife Conservation Council, Desert Flycasters, Federation of Flycasters, Mothers for Clean Water, Old Pueblo Trout Unlimited, Sierra Club, Trout Unlimited and others. recovery populations is observation by snorkeling. Arizona’s state hatcheries at Silver Creek and Tonto Creek assist with Apache trout production. Hatchery staff stock several waters in eastern Arizona for recreational fishing, including the East Fork of the Black River, lower West Fork of the Black River, the Little Colorado River in Greer, the West Fork of the Little Colorado River at Sheep Crossing, and upper Silver Creek. The state also stocks some lakes, of which Lee Valley Lake is most notable. Most of these stocked areas are open to fishing and allow a normal bag limit of harvested trout. However, some locations have special gear and bag limit restrictions. 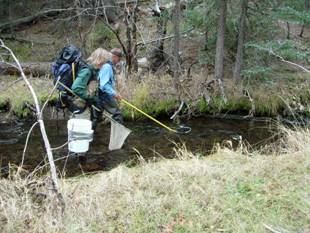 Most wild populations of Apache trout will be managed as fishable populations. However, recovery streams may be temporarily closed to allow newly reintroduced Apache trout to reproduce to a level that will support regulated angling. These streams usually reopen once the populations are established, and may retain some special regulations to ensure population viability. Check the current fishing regulations to find Apache trout streams that are open to fishing (click here for the Apache trout fishing page). White Mountain Apache Tribe initiated Apache trout conservation efforts when the only known populations existed on the Fort Apache Indian Reservation. On March 24, 1955 the tribe closed all streams within the boundaries of the Mount Baldy Wilderness Area to fishing. Subsequently, other streams deemed important to Apache trout conservation were also closed to fishing. Intensive fishery surveys were conducted by the U.S. Fish and Wildlife Service and the Arizona Game and Fish Department in cooperation with the White Mountain Apache Tribe to determine the Apache trout status. A controlled propagation program was initiated as part of the federal and state Apache trout recovery effort. 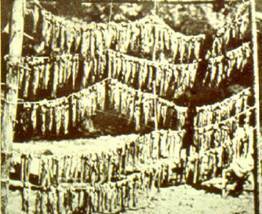 Apache trout stockings into streams began in 1963. Starting in the early 1960s, fish barriers were constructed on several streams to prevent upstream migration of nonnative trout. 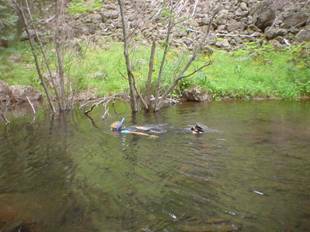 Several streams were renovated to remove non-native rainbow trout, brown trout, and/or brook trout. Pure Apache trout were stocked into streams following renovations. Despite early conservation efforts, Apache trout were considered endangered under the Federal Endangered Species Preservation Act of 1966. Apache trout became federally protected with passage of the Endangered Species Act in 1973. The Apache trout was one of the first species to be down-listed from endangered to threatened after re-evaluation of its status. The down listing included a 4(d) rule that allows the state to authorize selective angling opportunities. Hatchery reared fish were stocked to establish angling opportunities. The recovery team prepared an initial recovery plan for Apache trout. The plan was updated in 1983. 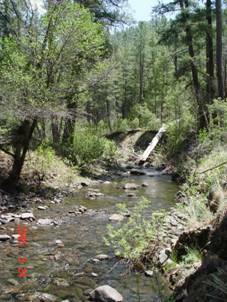 The Arizona Game and Fish Department in cooperation with the U.S. Forest Service developed a habitat improvement plan to install approximately 30 miles of riparian fencing to protect important stream segments from livestock and/or elk damage. The U.S. Forest Service in cooperation with the Arizona Game and Fish Department began the National Environmental Policy Act (NEPA) process for implementing remaining recovery actions that would lead to delisting. The process was completed in late 2002. Some stream renovations started. Subsequent challenges by various stakeholders postponed most planned recovery actions. The remaining proposed actions are currently being re-evaluated with the goal of implementing recovery actions starting in May 2004. 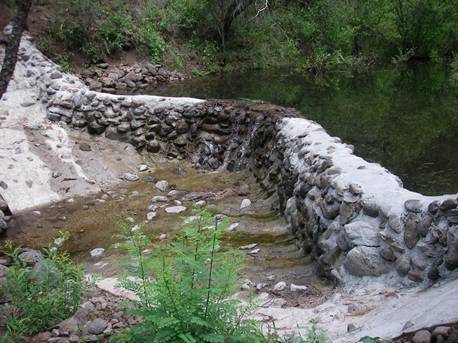 Many fish barriers were constructed on streams to prevent upstream migration of nonnative trout. Stream renovations and subsequent stockings of pure Apache trout continued. The recovery plan was updated and was published on the Federal Register for public review in July 2007. Recovery criteria may be met at the end of 2007.